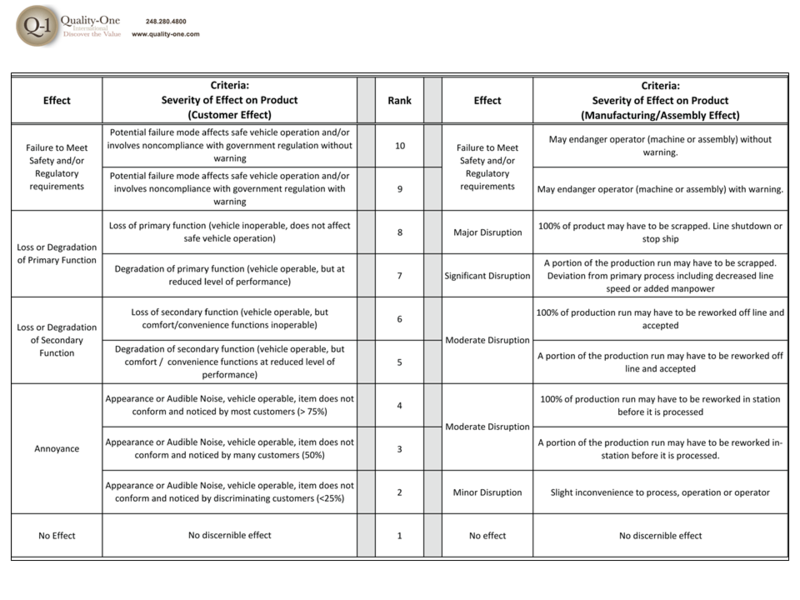 There are numerous high-profile examples of product recalls resulting from poorly designed products and/or processes. These failures are debated in the public forum with manufacturers, service providers and suppliers being depicted as incapable of providing a safe product. Failure Mode and Effects Analysis, or FMEA, is a methodology aimed at allowing organizations to anticipate failure during the design stage by identifying all of the possible failures in a design or manufacturing process. Developed in the 1950s, FMEA was one of the earliest structured reliability improvement methods. Today it is still a highly effective method of lowering the possibility of failure. Failure modes are the ways in which a process can fail. Effects are the ways that these failures can lead to waste, defects or harmful outcomes for the customer. 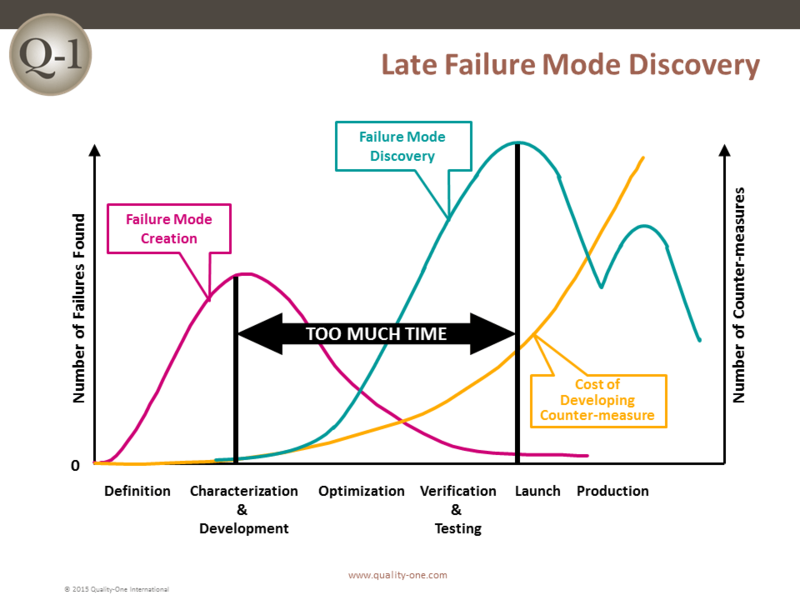 Failure Mode and Effects Analysis is designed to identify, prioritize and limit these failure modes. FMEA is not a substitute for good engineering. Rather, it enhances good engineering by applying the knowledge and experience of a Cross Functional Team (CFT) to review the design progress of a product or process by assessing its risk of failure. 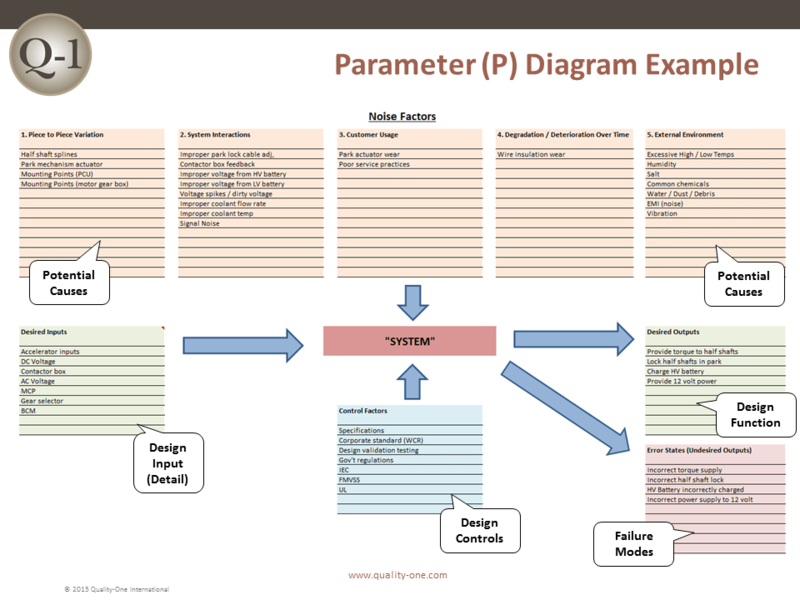 There are two broad categories of FMEA, Design FMEA (DFMEA) and Process FMEA (PFMEA). Historically, the sooner a failure is discovered, the less it will cost. 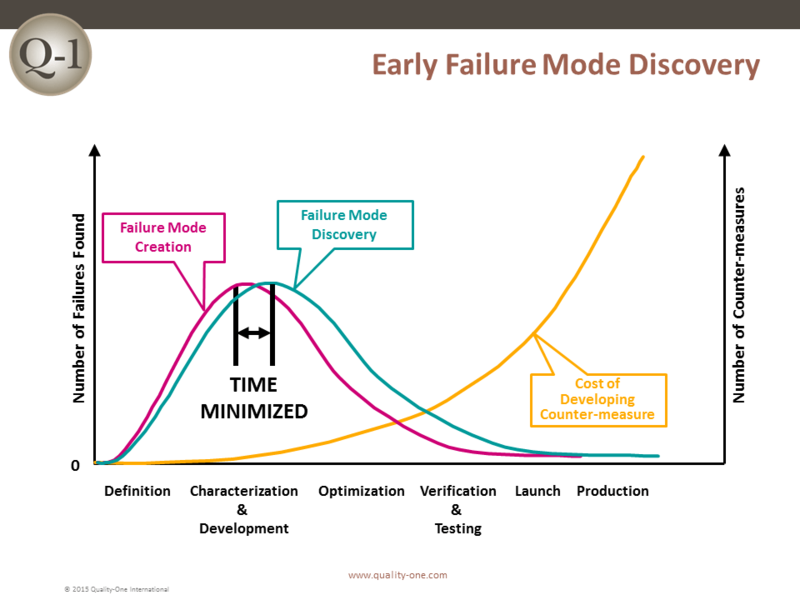 If a failure is discovered late in product development or launch, the impact is exponentially more devastating. Ultimately, this methodology is effective at identifying and correcting process failures early on so that you can avoid the nasty consequences of poor performance. In addition, it is advisable to perform an FMEA occasionally throughout the lifetime of a process. Quality and reliability must be consistently examined and improved for optimal results. 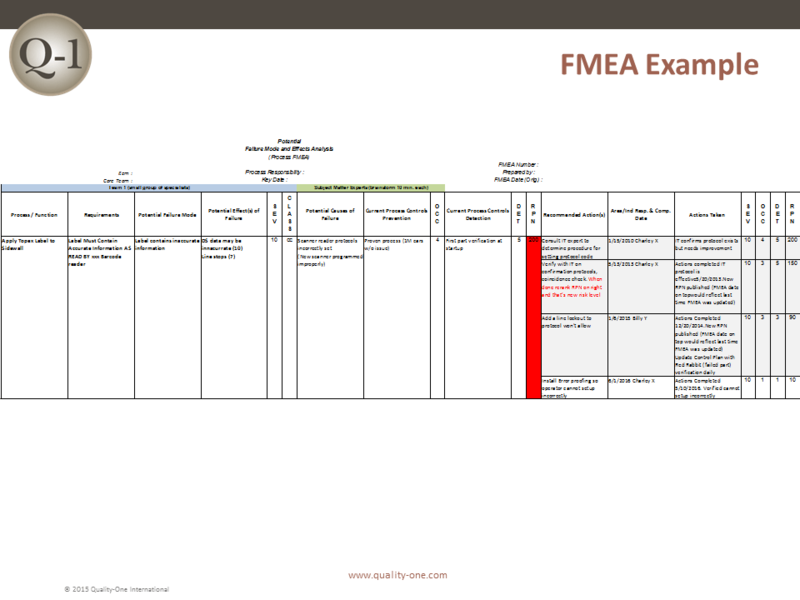 FMEA is performed in seven steps, with key activities at each step. The steps are separated to assure that only the appropriate team members for each step are required to be present. 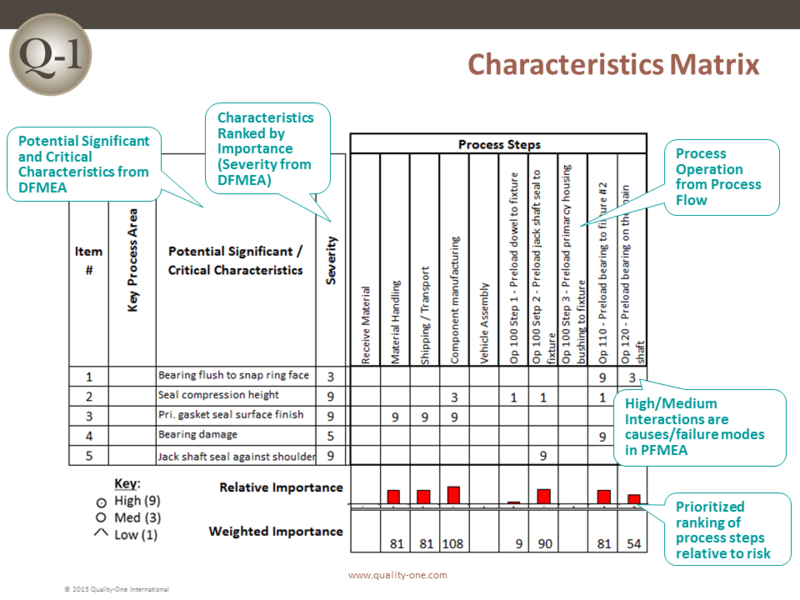 The FMEA approach used by Quality-One has been developed to avoid typical pitfalls which make the analysis slow and ineffective. The Quality-One Three Path Model allows for prioritization of activity and efficient use of team time. Path 1 consists of inserting the functions, failure modes, effects of failure and Severity rankings. The pre-work documents assist in this task by taking information previously captured to populate the first few columns (depending on the worksheet selected) of the FMEA. Path 3 Development involves the addition of Detection Controls that verify that the design meets requirements (for Design FMEA) or cause and/or failure mode, if undetected, may reach a customer (for Process FMEA). Actions are determined to improve the controls if they are insufficient to the Risks determined in Paths 1 and 2. Recommended Actions should address weakness in the testing and/or control strategy. Review and updates of the Design Verification Plan and Report (DVP&R) or Control Plans are also possible outcomes of Path 3. 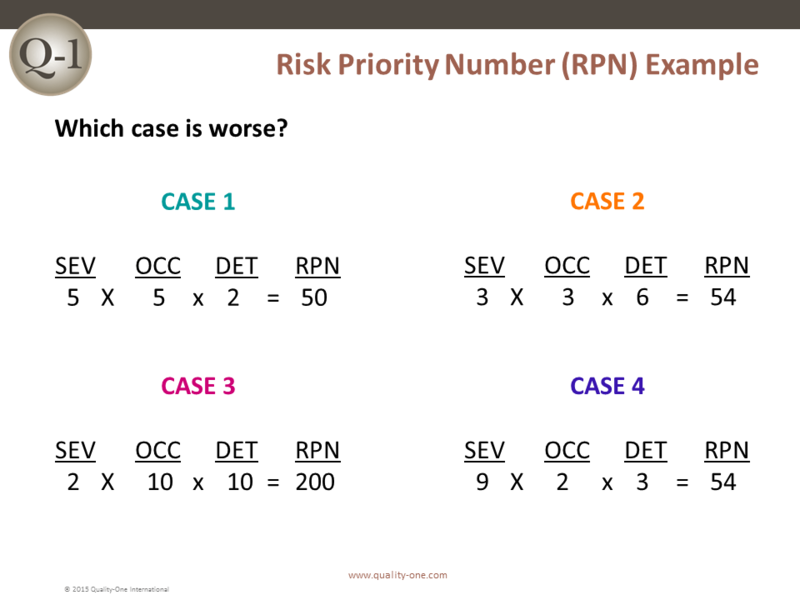 The Actions that were previously determined in Paths 1, 2 or 3 are assigned a Risk Priority Number (RPN) for action follow-up. FMEA Actions are closed when counter measures have been taken and are successful at reducing risk. 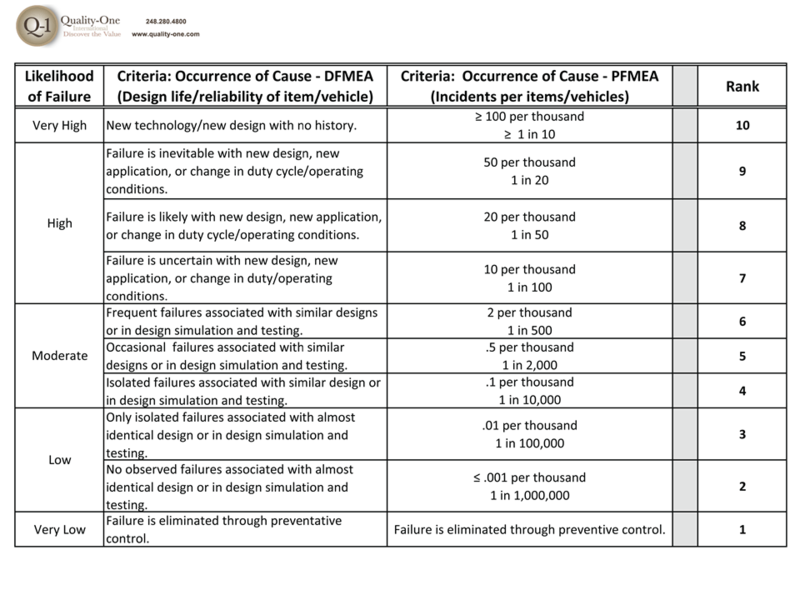 The purpose of an FMEA is to discover and mitigate risk. FMEAs which do not find risk are considered to be weak and non-value added. Effort of the team did not produce improvement and therefore time was wasted in the analysis. Deciding when to take an action on the FMEA has historically been determined by RPN thresholds. Quality-One does not recommend the use of RPN thresholds for setting action targets. Such targets are believed to negatively change team behavior because teams select the lowest numbers to get below the threshold and not actual risk, requiring mitigation. 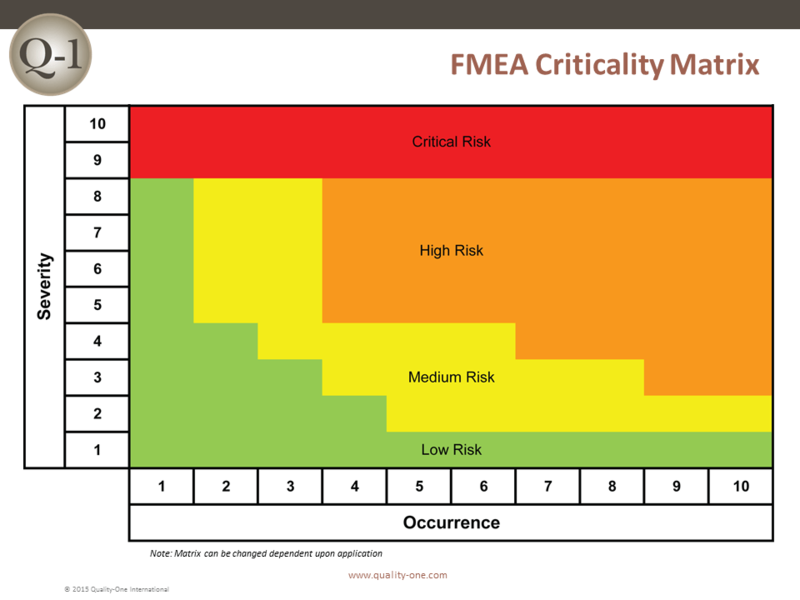 When completed, Actions move the risk from its current position in the Quality-One FMEA Criticality Matrix to a lower risk position. The problem statements and descriptions are linked between both documents. Problem solving methods are completed faster by utilizing easy to locate, pre-brainstormed information from an FMEA. 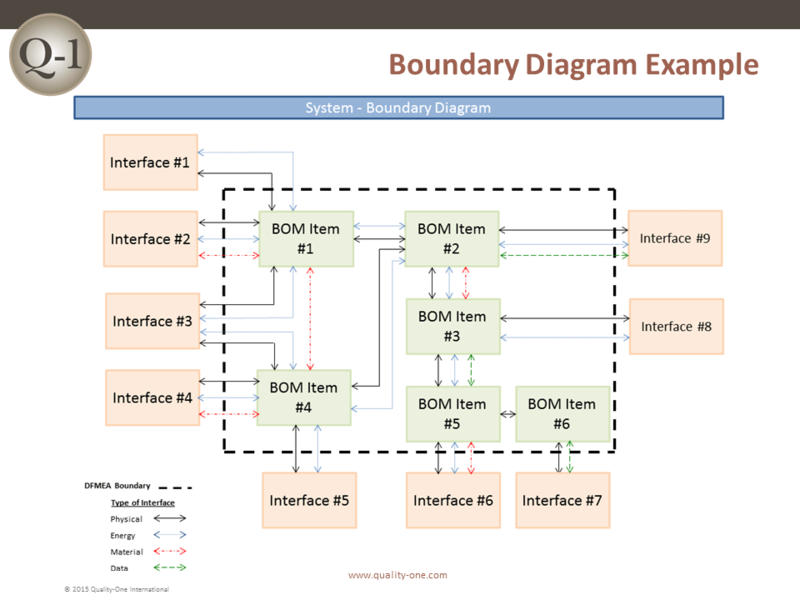 Possible causes in an FMEA are immediately used to jump start Fishbone or Ishikawa diagrams. Brainstorming information that is already known is not a good use of time or resources. 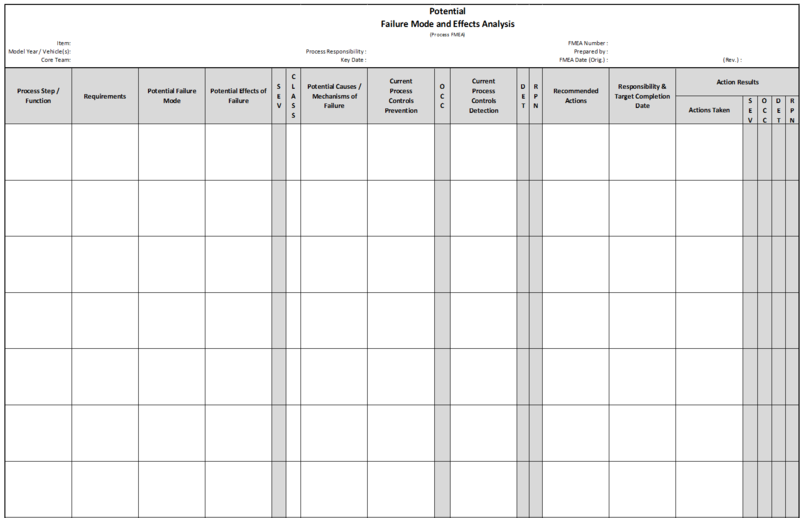 Data collected from problem solving is placed into an FMEA for future planning of new products or process quality. This allows an FMEA to consider actual failures, categorized as failure modes and causes, making the FMEA more effective and complete. 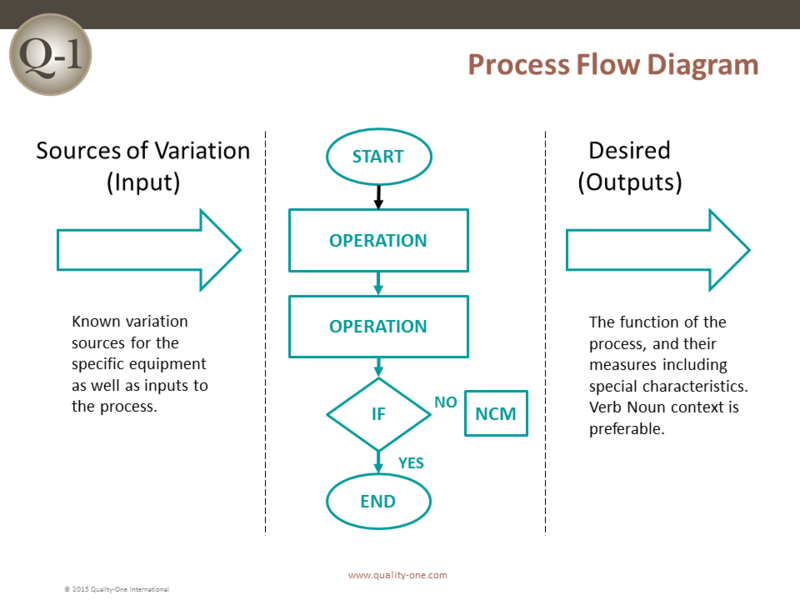 The design or process controls in an FMEA are used in verifying the root cause and Permanent Corrective Action (PCA). The FMEA and Problem Solving reconcile each failure and cause by cross documenting failure modes, problem statements and possible causes. 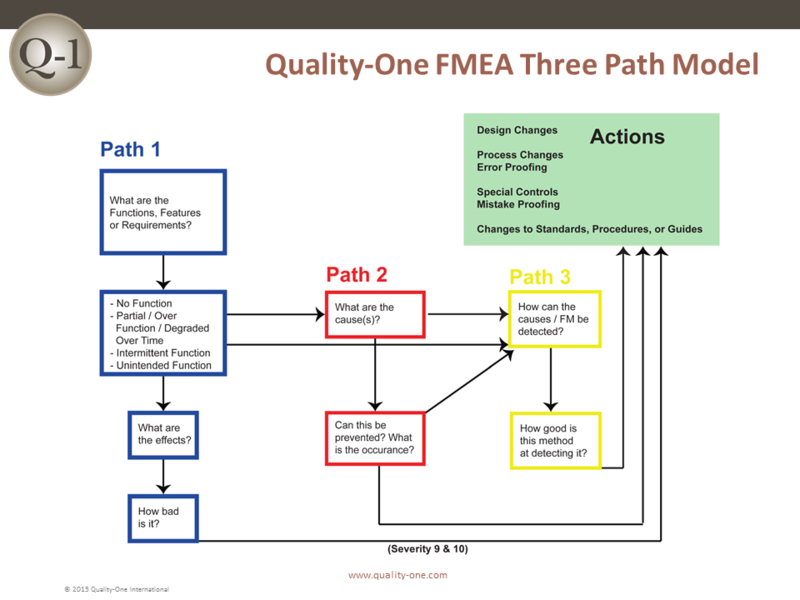 This FMEA Example has one item with a progression through multiple recommended Actions. 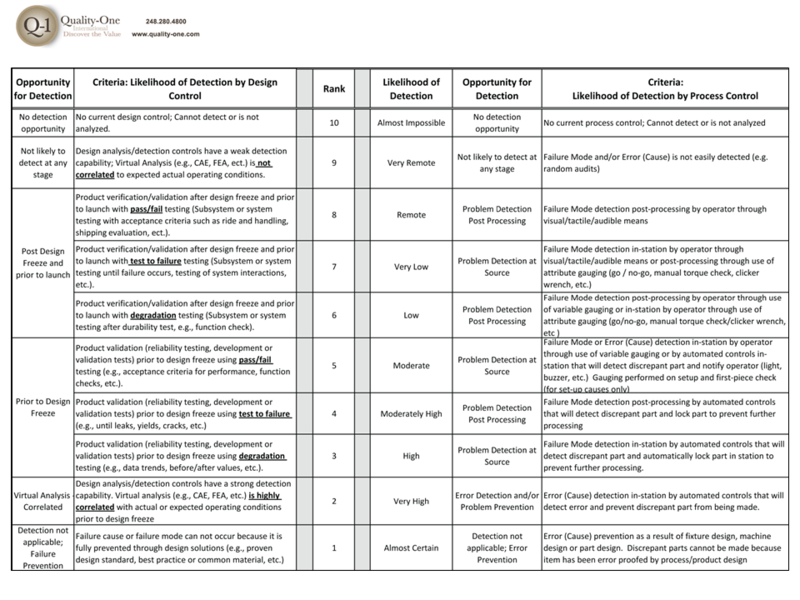 With each instance, the revised RPN has improved. The final RPN of 10 indicates the issue has been mitigated successfully. The new state should be captured as Standard Work.